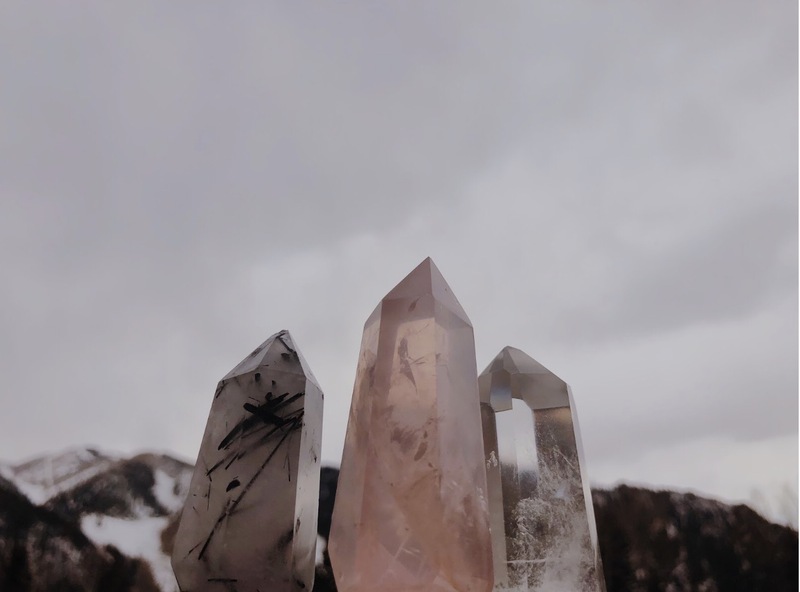 Three dazzling crystal points on a cloudy day with snowy Aspen mountain in backround from left to right: Black Tourmaline Crystal Quartz, Rose Quartz, Crystal Quartz. For thousands of years, people have used alternative medicine to cure the body, mind, and spirit. Healing stones are one of the most popular forms of alternative medicine and have recently become a huge trend. 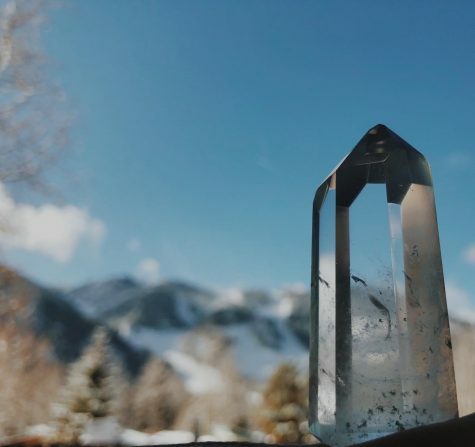 Healing crystals work by connecting to Chakras: the seven energy centers of the body, including the Crown, Third Eye, Throat, Heart, Solar Plexus, Sacral, and Root Chakra. While there is no scientific proof of the crystals working, there are lots of reports of intense healing, heat, vibrations, and changes of emotions. Here are five stones perfect for high school students to get through the difficulties of life. For centuries amethyst has been a symbol of wealth. 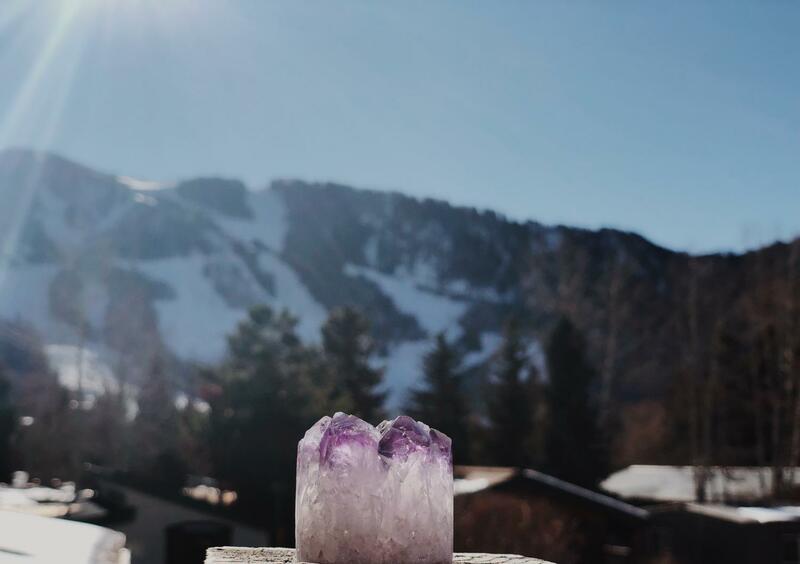 The Greeks and Romans believed that amethyst could prevent intoxication, so they carved their drinking vessels from the mesmerizing stone. According to Greek myth, one day the god Bacchus became angry, vowing to dispatch tigers upon the first person who crossed his path. A young girl, named Amethyst, crossed the path of Bacchus and before the tigers could eat Amethyst, she was saved by a goddess, who turned her into a clear crystal. Bacchus, remorseful for the fate he had caused the girl, poured the juice of grapes over the stone she had become as an offering and thus gave the gem it’s unique purple coloring. Amethyst is mostly revered as a protective, abundant, and stress relieving stone. 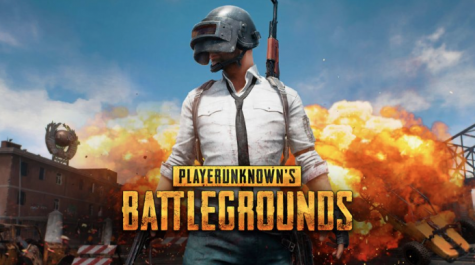 It is especially effective at relieving work or school-related anxiety and stress. How to use: Amethyst forms in crystals and clusters and is a great stone for meditation. Place the stone in front of your feet while meditating. The stone is also excellent decor in homes for drawing out negative energy. Crystal Quartz is the most abundant gemstone in the world and can be found on every continent. Known as the “Master Healer,” Crystal Quartz can connect to all the Chakras and is a great beginner stone. Crystal Quartz is the stone of clarity and purity. When used it can relieve stress, help focus, create pure thoughts, and build an overall sense of well being. How to use: When used in meditation crystal Quartz can be put on any Chakra that is in need. For example, if you are stressed and need help focusing, meditate holding the stone to your forehead on the Crown Chakra. 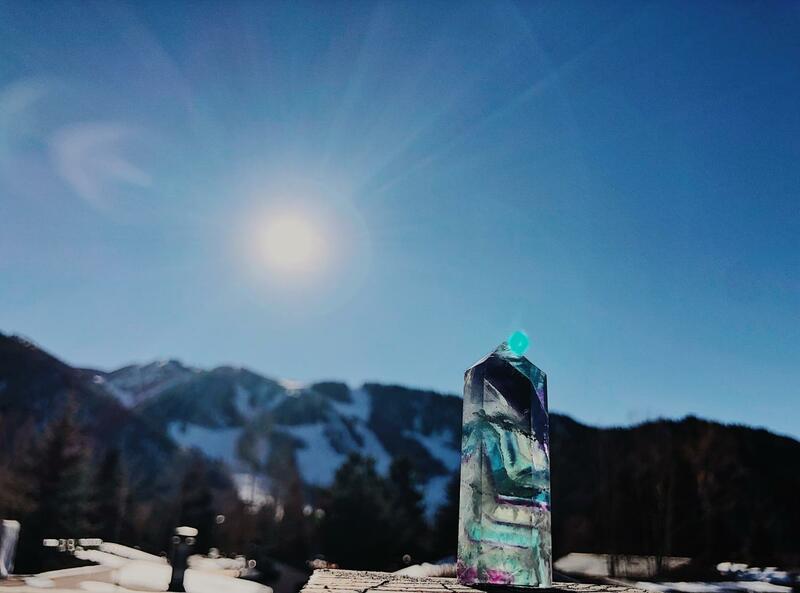 A Crystal Quartz point in the shadows of a bluebird sky winter day with Aspen mountain in the backround. Fluorite use can be dated back to the Egyptians and Chinese. The stone was treasured for its beautiful and unique coloring. Fluorite enhances the ability to find happiness and discover ones divine purpose in life. 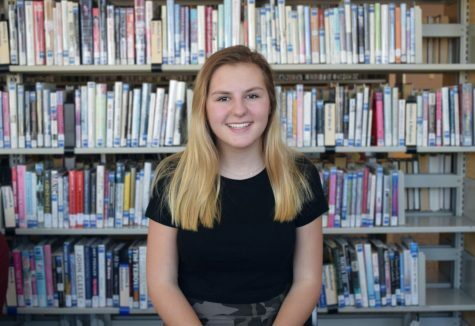 The stone is considered the most effective stone for students because it improves focus, better memory, removes mental blocks, and has been highly regarded with helping with ADHD and learning disabilities. How to use: When studying or testing, Fluorite is best used as a rubbing stone to enhance focus. Hold the stone in the palm and rub the smoothest part of the rock back and forth until one feels focused and calm. A multi-colored Fluorite point catching the sunlight on a bright winter day with Aspen mountain in the background. Agate comes in many forms and is constructed when ingenious rock and groundwater mineralize. Agate gets its name from the philosopher Theophrastus who found an agate stone when walking along the shore of the river Achates in ancient Sicily. It has been used for centuries as a protective stone from natural disasters and evil spirits. Agate is known as the balancing stone. In its many forms, it can help create harmony and balance in one’s life along with calming and helping face fears. How to use: When meditating with agate one should hold one agate stone in each hand to balance the spirit and the Chakras. 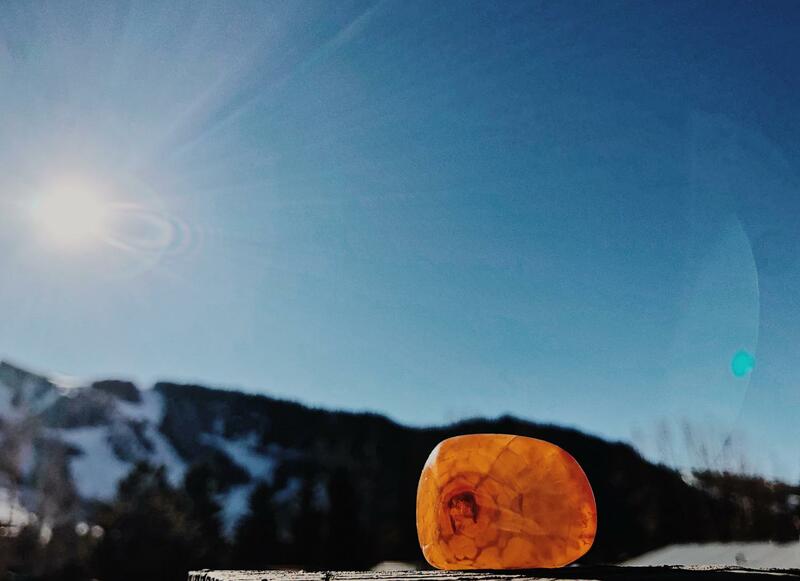 A mesmerizing, vibrant snakeskin agate rubbing stone on a bright day with snow covered Aspen mountain in background. In ancient Egypt, Carnelian was widely used and worshipped. Today, many artists and singers, including Adele, swear by Carnelian’s abilities and adore it’s varying warm and vibrant hues of orange and red. Carnelian, otherwise known as the singer’s stone, is widely used to boost confidence, self-esteem, and most of all creativity and true expression. How to use: Carnelian is best used in jewelry and rubbing stones. Before needing to perform or be creative Carnelian can be held close to the root Chakra or the heart Chakra. Use Carnelian before a performance/presentation, or during math class to help with creative solutions to problems, and of course during an art class. 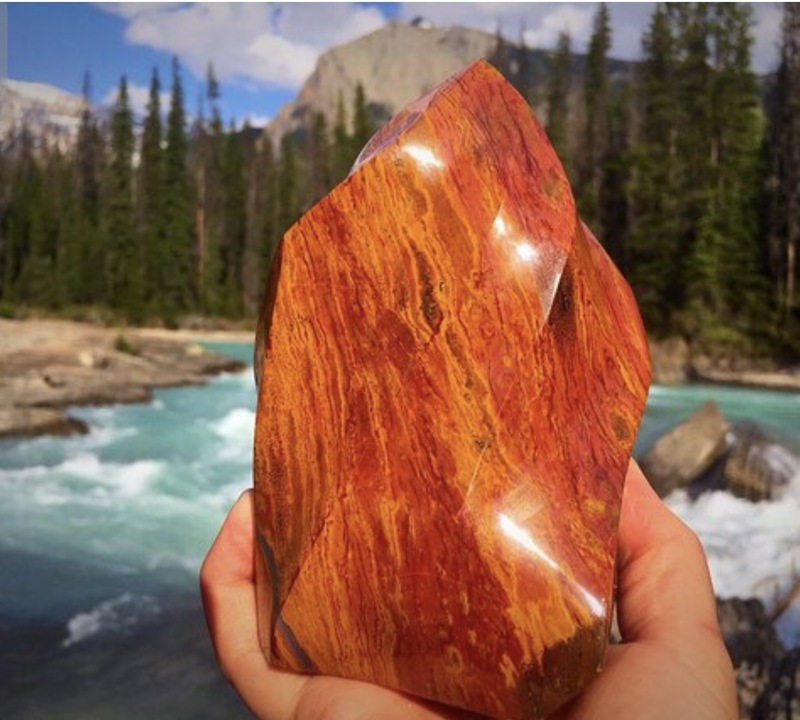 A large decorative Carnelian stone with icy blue river and vivacious pine trees in background.